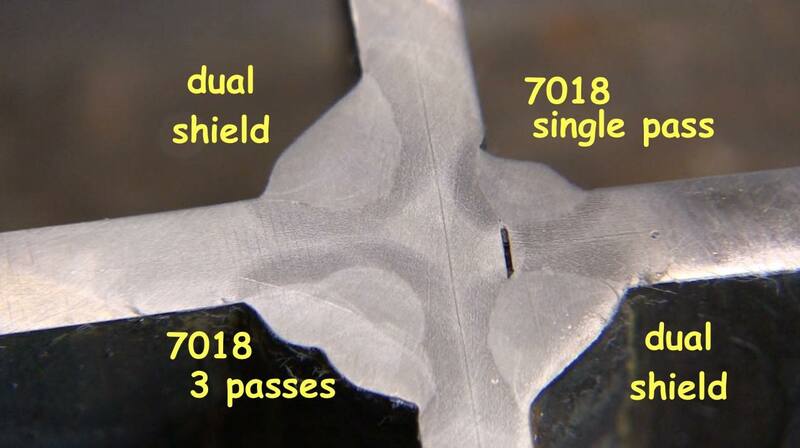 If you are struggling with overhead welding using 7018 stick electrodes then here is a piece of advice for you. Then hold a tight arc. Sure, its not quite that simple but that is the main thing folks get wrong. I remember when I was learning to weld overhead, I thought that I needed to lower the amperage to prevent the weld puddle from sagging. The amperage for overhead welding is about the same as for welding on the bench in flat or horizontal position. The key is a tight arc and good rod angle. keep a tight arc and dont get crazy with the electrode angle and things will go alright. A rule of thumb for setting amperage for 7018 rods is one amp per one thousandths of diameter. since 1/8" = 125 thousandths, 125 amps is a good starting point for 1/8" 7018 rods. Its a good starting point but often times increasing amperage to around 135 amps works good too. make sure the polarity is set correctly. I spent an hour chasing my tail while filming this video because I accidentally set the polarity wrong. Self shielded flux core wires typically require DCEN. For this video I used 1/4" thick steel and .045" (1.1mm) E71t-1 wire. 24 volts, 333 ipm, 30cfh flow rate using C25 gas. I worked with my friend Andrew Cardin to film this 4g welding test video. Gravity not only affects the molten puddle but tends to pull your arms down which makes it harder to hold a tight arc or short stickout. Its harder to get comfortable so that you can be steady. Once you figure out how to work around these issues, its just not that hard. Remember, just do the same thing you would do on the bench and hold a tight arc.